International Business China promises ‘all necessary measures’ to defend companies abroad amid legal clashes between Huawei, U.S.
Chinese Foreign Minister Wang Yi listens to a journalist's question during a news conference on the sidelines of the annual meeting of China's National People's Congress, in Beijing, on March 8, 2019. 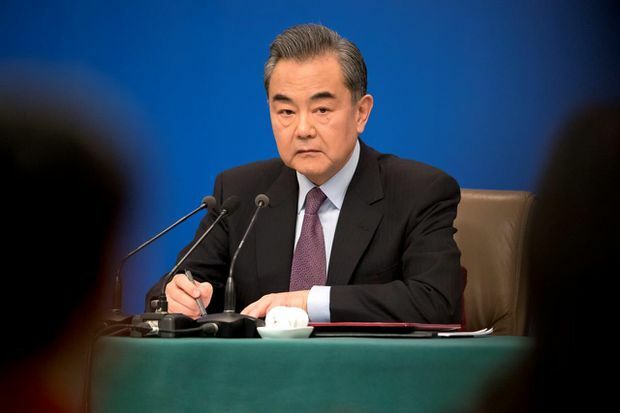 China’s foreign minister on Friday promised “all necessary measures” to defend Chinese companies and citizens abroad amid legal clashes between tech giant Huawei Technologies Co. Ltd. and Washington. Recent legal action against Chinese companies and individuals is “deliberate political suppression,” Wang Yi said at a news conference. Mr. Wang was responding to a question about Beijing’s stand on Canada’s arrest of a Huawei executive on U.S. criminal charges and the company’s lawsuit in an American court aimed at overturning restrictions on sales of its telecom equipment. “Recent actions against specific Chinese enterprises and individuals are not simply judicial cases, but deliberate political suppression,” Mr. Wang said. Beijing will take “all necessary measures to resolutely safeguard the legitimate rights and interests of Chinese enterprises and citizens,” he said. China’s government has demanded that Canada release Huawei’s chief financial officer, who is fighting U.S. efforts to extradite her to face charges of lying to banks about dealings with Iran. Mr. Wang gave no details of what Beijing might do, but a Canadian former diplomat and a businessman have been arrested in China in what is widely seen as an effort to pressure Canada. Authorities also have slowed imports of Canadian canola by imposing more stringent inspections. Meanwhile, Huawei faces charges including theft of trade secrets in a case in U.S. federal court in Seattle. The company pleaded not guilty this month. On Thursday, Huawei announced it filed a lawsuit asking U.S. federal court to throw out a portion of this year’s American military appropriations bill that bars the government from using its technology or dealing with contractors that do.